This photo was taken on September 24, 2014 at 8:16 AM. The location was Arlington, Virginia. The "Take It!" came from being fascinated with reflections that are unusual. This one was viewed from my car while sitting at an intersection waiting for a traffic signal. 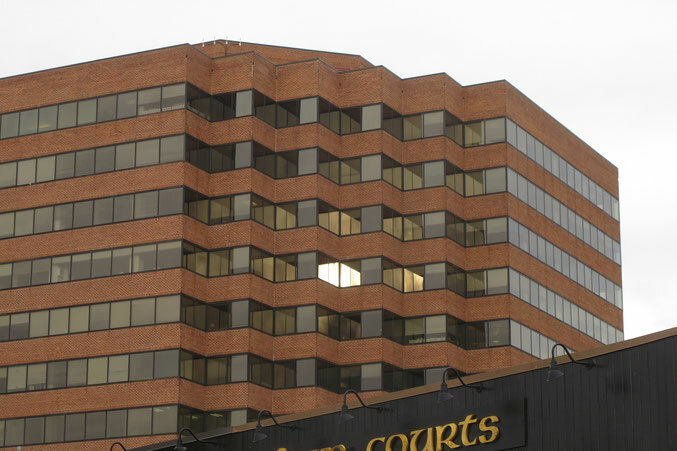 The way the one window on the whole side of the building happened to be shining as a result of the sun casting just the right light in the right way during this overcast morning was an eye catcher to me. That it was symmetrically centered was another stroke of sheer chance. The After Take: All that I have shown this photo to seem to be struck with the simplicity of it and join me in the marvel of the catch. This is yet another example of the little stuff that can take away a bit of one's breath. Here is hoping you have one of these little sightings that seem to not be spectacular but definitely are worthy of a second glance. I find it strange that it's just happening on that one pane. The edges of the building caught my eye at first. It is a very unique design. I have quite a few pictures to catch up on. We moved and just got internet hooked up. I'm going to save them for lunch tomorrow. Glad to see a bunch posted in my absence! Ha! Before I read it I figured you took a picture at the exact moment someone in the building was taking a picture with their flash on.